We all know laughter is good for us, but a strong tie has been made between laughter and breathing. From the Philippine Star comes a story on Laughing and Stress Relief. Regardless of whether or not you study yoga, it has been established that motion creates emotion. Think about it. The direct link between the body and the mind has also been clearly proven. Whatever happens to your mind, happens to your body. For example, if you observe depressed and sad people, their bodies are also depressed. They walk slowly, talk slowly; all their bodily movements are slower. Dr. Kataria said in the article that father often told him, “If you are sad, don’t sit idle, keep doing some physical work, go for a walk or jog, and you will feel better.” He did feel better by keeping his body active. This proves the two-way link between body and mind: If we can change the quality of our thoughts, then we can change our body behavior. 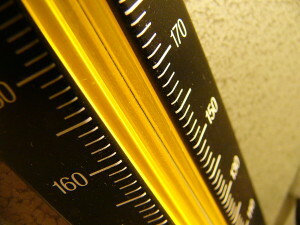 For each type of thought pattern, there is an appropriate body behavior. If we can bring a change in bodily behavior by changing physical gestures voluntarily we will experience peace in our minds. The lesson? Laughter truly is the best medicine! and for a variety of reasons. In a story on the website MedIndia – Network for Health, sighing actually increases the flexibility of the human breathing system. The study was undertaken by researchers at the University of Leuven in Belgium. They rigged up eight men and 34 women with sensor-equipped shirts that recorded their breathing, heart rates and blood carbon dioxide levels over 20 minutes of quiet sitting. What the scientists were looking for were specific changes over one-minute periods encompassing sighs that could confirm or contradict the ‘re-setter hypothesis’ for the function of sighing. “Our results show that the respiratory dynamics are different before and after a sigh. We hypothesize that a sigh acts as a general re-setter of the respiratory system,” said Elke Vlemincx, one of the co-authors. The re-setter hypothesis is based on the idea that breathing is an inherently dynamic and chaotic system, with all sorts of internal and external factors changing how much oxygen we need and keeping our lungs healthy and ready for action. According to researchers, when breathing is in one state for too long, the lungs deteriorate. They become stiffer and less efficient in gas exchange. So, in times of stress, when breathing is less variable, a sigh can reset the respiratory system and loosen the lung’s air sacs, or alveoli, which may be accompanied by a sensation of relief. The study was published in a recent issue of the journal Biological Psychology. I found myself on a massage table recently (I know, tough duty), face down and ready for some bodywork. I once again realized I had forgotten a key massage ingredient – eucalyptus oil. I am cursed with sinuses that tend to fill up quickly when I lay face down. Not sure if this is a common problem, but it can quickly convert a relaxing massage into a fight for breath. I like to work with my massage therapist using deep-breathing techniques, for maximum benefit. When my sinuses are clogged, I derive less from the experience. I have found, thanks to a sympathetic massage therapist a while back, that a tiny bit of eucalyptus oil, available at many health food stores, or other essential aromatic oils such as peppermint can help dramatically in such situations. Though eucalyptus can be a bit harsh if used to excess or if applied directly to the nostrils, and can cause a reverse reaction if used too much, a drop or two of eucalyptus on a cotton ball can keep you breathing fully while in the face-down position. Aromatic oils can also be a blessing during cold and flu season, as can anything containing a healthy does of hot peppers. Seem like such a simple solution, but it works, and way better than developing dependcies on over-the-counter meds which contain oxymetazoline (Afrin), phenyleherine (Neosynephrine) or xylometazoline (Otrivin or Inspire). You can also purchase simple saline nose sprays which can be effective. We’d love to hear about your experiences. I can’t be the only one who suffers in the face-down position! Drop us a note! 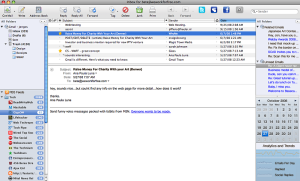 A while back I heard a funny and yet disturbing term – “Email Apnea.” This term was coined3062892657_2f0ce222d4_o by Linda Stone a few years ago after she noticed that she held her breath while opening emails. She also noticed that nearly everyone else that she observed was doing the same thing. Unfortunately, this affliction is not just limited to opening emails. It pervades nearly every aspect of our lives, from waiting to see who’s number comes up on caller-id when the phone rings to, to getting caught behind a slow driver when you are in a hurry. The other day, my laptop hard drive made it clear that it was in its death-throes. I had a fair amount of work on it that was not backed up. I quickly attached a back-up drive, which promptly informed me that it would take six minutes to copy the files. About 2 minutes in I realized that I had stopped breathing as I watched the seconds tick by – apparently thinking that suffocating myself would move those bits across the cable just a bit faster. Once you begin to develop an awareness of your breath, you begin to notice more and more often the situations that cause you to hold your breath – and there are hundreds of them. In many cases not only is holding your breath counter-productive, but focusing on your breath can actually be extremely beneficial. That is why athletes, actors, musicians, and performing artists of all kinds integrate these techniques into their disciplines. Of course the breath is critical to providing energy to your muscles, but it also has a dramatic effect on your emotions, your ability to manage stress and anxiety, and it is also the doorway to that in-the-moment creative space referred to as the zone. Develop an awareness of your breath. It will become a very powerful resource in those moments where you really need it and can dramatically impact your health, emotions, and physical performance. Once you begin to become aware of the moments and situations that are stealing your breath, you’ll realize that most of them make about as much sense as holding your breath when you open an email! To learn how to start developing your breath awareness, download our free “Get Started Now” e-book. It’s Spring! Breathing Reminders for Nearly Everything! Here at PerfectBreathing.com, we cover a lot of territory when it comes to using the breath perfectto improve your life. In our vast Articles Library, we offer myriad ways to take advantage of the breath’s powerful effect on every dimension of your life, especially this time of year. Spring is time for renewal. cleaning out the unwanted, changing bad habits, and planting new seeds for a fruitful year. We can help. Trying to keep those almost-forgotten New Year’s resolutions? Try our Reaching Your Goals in the New Year or Your Best Year Ever – One Breath at a Time. Want to improve your golf score, tennis serve, batting average or overall physical performance? We’ve got it here. Check out Breathing Your Way to Olympic Gold, Breathing and Sports Performance, or Ed Viesturs – The Thin Air of Everest, among many in our Performance section. 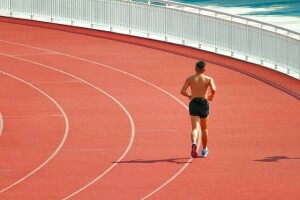 Are you just starting to work out again after the long winter and dealing with a little pain? Try How to Cope with Pain and Physical Therapy and Three-Dimensional Breathing for some insight. Taking a relaxing vacation this summer, but are afraid to fly? Visit Control Your Fear of Flying. Planning a summer wedding but finding the stress too much to deal with? Try Summer Wedding Stress Relief. Just want to feel better? We suggest Let Breathing Help Control the Body’s Healing Process, Nudge Down High Blood Pressure, or Health and Healing: Just a Breath Away. And feel free to just ramble through these informative pieces in a variety of useful categories. Drop them into your company newsletter, print them out and put them on the refrigerator, or email them to your friends and family in need. Life is better when you breathe well. How can you relieve stress? Awareness! I believe that the most powerful concept that we addressed in the book “Perfect Breathing: Transform Your Life One Breath at a Time” was the concept of awareness. Not that this was our brain-child – I think someone beat us to the punch by five or ten thousand years – but it is hands down the most important tool at our disposal when it comes to making changes, improving our lives, and dealing with stress. We feel strongly that developing an awareness of your breath is the most practical, efficient, and accessible method of developing mind/body awareness and devote a considerable amount of ink in “Perfect Breathing” to helping people accomplish that. First, forget about getting rid of stress or even managing it. It is ever-present and usually it arises from things that we have no control over. Instead, focus on something that you do have control over – namely “you.” In any given situation, the constants, the things that you always have control over are your thoughts and your actions. Secondly, stress is not something that is thrust upon you. You are not a victim of stress. It is something that you create. Stress arises when our circumstances require a change of behavior when we would prefer to keep doing business as usual. Using the mindfulness technique of (figuratively) stepping back, taking a deep breath and asking the question “why am I stressed?” or “why am I angry or frustrated?” or “what am I resisting?” is an amazingly effective technique for diffusing stress. That brings us to the third tip: Breathing. Your breath has the power to counteract the “fight or flight” chemicals that are coursing through your body and shift your thought process away from the “woulda, shoulda, couldas” of the past and the “what-ifs” of the future. It brings you solidly back to the here and now, where as it turns out, everything is actually happening. And to complete the circle, as mentioned earlier, focus on the breath deepens your awareness of your mind, body, and emotions, which in turn allows you to clearly see the actions and behaviors that are creating stressful situations. So in honor of Stress Awareness month give these simple techniques a try and turn the tables on stress! 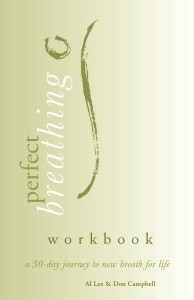 Sign Up Now for the Perfect Breathing eWorkbook Series! Perfect Breathing is now proud to offer a new eWorkbook Series: Perfect Breathing – A 28-Day Transformation to Better Living. It’s said that it takes 28 days to build a new habit. Our new eWorkbook series – delivered every day for 28 days to your email box – will teach you to how to be aware of your breath and consciously use it in your daily life to hep you immediately improve your health, ability to heal, mental and physical performance, and emotional well-being, as well as deepen your human experience. Sign up now! To help us gain a deeper understanding of how this all works and how we can safely train the breathing muscles, we enlisted the help of good friend, gifted yoga instructor, physical therapist, and long-time Yoga Journal contributor, Julie Gudmestad. It is this first scenario that we will concern ourselves with here. Many athletes will go to any lengths with training, equipment, and technology to squeeze out the slightest performance improvement. Julie laughs about a conversation with a well-known bike racer, who was regaling her with detailed descriptions of the expensive alloy parts he had acquired, shaving additional ounces off the weight of his bike. When she asked, “What are you doing to stoke the furnace that runs all of this,” he apparently didn’t have much to say. Most of us – athletes or not – are not trained or conditioned to think much about our breathing and the untapped potential that it holds. It is easy to believe that it is automatic and simply takes care of itself. The truth is that it doesn’t take care of itself. It requires awareness and effort to maintain and improve your breathing abilities against the constant onslaught of gravity and our own disruptive patterns. It is the same case for your breathing. Imagine sitting slumped, whether at your desk, behind the wheel of your car, or bent over riding on a bike. The muscles on your front body shorten up. You lose mobility of your upper abs. Everything tightens up around individual ribs, and the heavy muscles and connective tissue on the front of your chest get shorter and limit your ability to open up your lungs and breath properly. The longer it continues, the more you lose flexibility, and it’s harder it is to get it back, especially after your 40th birthday is fading in the rear view mirror. We highly recommend keeping your breathing mechanism in shape so you don’t have to worry about getting it back! All of these muscles, except the diaphragm, are accessory muscles of respiration. Under normal circumstances the diaphragm is the prime mover of respiration, but when you need more oxygen and you need it faster, those ancillary muscles become very important. The stronger your muscles and the wider the range of motion, the more effectively and efficiently you can draw air into your lungs. On the flip side, a relaxed exhale is simply the elastic recoil of all those previously mentioned muscles as they release the contraction. But when you need to get air out faster, you use your abdominal and intercostal muscles to compress the abdomen and ribcage, which expels the air more quickly. Problems happen when you use accessory muscles to do the main work of breathing, due to stress, posture, restrictive clothing, or difficult emotions. Overworking these “accessory” breathing muscles can result in headaches, anxiety, higher blood pressure and all the other bad outcomes researchers have been documenting for many years. In this case the diaphragm does not do its job properly and will atrophy over time, just like every other unused muscle. So where should the average person start? What training will give you the most benefit? Julie recommends exercises and stretches that open up the ribcage and strengthen the intercostals and diaphragm. Start by lying on a small roll (bath towels rolled up the long way) under your spine, from your tailbone out past the top of your head. Stretch your arms out to the sides, with your shoulders and elbows each bent to 90 degrees. Breathe and relax as gravity helps you open your front body. This gently stretches the shortened pecs, intercostals, and upper abs. This position also takes pressure off the diaphragm, allowing it to move freely, allowing normal, relaxed diaphragmatic breathing to begin. Another helpful technique is to wrap a long belt (like a bathrobe belt) around your lower ribs, a couple of inches above your navel. Hold the ends of the belt and pull gently to provide a bit of resistance (to strengthen) and a bit of sensation to help you feel how the breath is moving, or not moving, as you breathe. You should be able to feel your ribcage expanding up and out as you inhale, and shrinking back in as you exhale. If you just aren’t ready for the commitment of rolling up a towel, belts, or lying on the floor, you can start by just putting your hands on your belly and feel it expanding out into your hands as you inhale. For those of you who are already on board with breathing training, you can use these exercises to further strengthen your breathing and respiratory muscles. First, lie on your back with your knees bent. Practice the pelvic tilt by flattening your low back while you exhale (try not to push with your legs), and then relax and let your low back lift as you inhale. Your obliques (the muscles forming a cross on the abdomen) and tranversus muscles (the deepest layer of abdominal muscles), are having to do double duty during this exercise: They compress the abdomen, pull down on the rib cage, and force exhalation. These are the muscles that are used for trumpet playing, sneezing and fast exhalations during aerobic exercise. Lastly, for those of you who would prefer a higher tech solution, there are devices such as the Power Lung (www.powerlung.com), which is a breathing trainer that creates adjustable resistance on both inhales and exhales and helps strengthen and exercise all of the respiratory muscles. If you would like to start enjoying the very real performance improvements that come from developing your breathing, then there is a little something here for everybody – just in time to start off the New Year! The key is persistence. Even a few minutes a day consistently will provide noticeable and worthwhile results and you will begin to see how much power and potential lies with your breath! So have you had experience with respiratory training? What worked for you? What results did you see? Please share. We’d love to hear from you! Julie Gudmestad is an Oregon Licensed Physical Therapist and Certified Iyengar Yoga Teacher. You can contact her at info@gudmestadyoga.com.